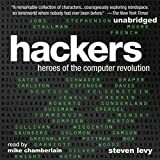 Steven Levy’s classic book traces the exploits of the computer revolution’s original hackers – those brilliant and eccentric nerds from the late 1950s through the early ’80s who took risks, bent the rules, and pushed the world in a radical new direction. With updated material from noteworthy hackers such as Bill Gates, Mark Zuckerberg, Richard Stallman, and Steve Wozniak, Hackers is a fascinating story that begins in early computer research labs and leads to the first home computers. Levy profiles the imaginative brainiacs who found clever and unorthodox solutions to computer engineering problems. They had a shared sense of values, known as “the hacker ethic” that still thrives today. Hackers captures a seminal period in recent history when underground activities blazed a trail for today’s digital world, from MIT students finagling access to clunky computer-card machines to the DIY culture that spawned the Altair and the Apple II. This entry was posted in Computer Books and tagged 25th, Anniversary, Computer, Edition, Hackers, Heroes, Revolution by Computer Education World. Bookmark the permalink.